Luxe Pack, the luxury packaging exhibition held in Monaco last month, had grown again this year with, it seemed, an even greater number of suppliers targeting the wine and spirits sector. A record 400 exhibitors, including 40 first-time exhibitors, presented an extensive range of creative packaging ideas and special decorating techniques using highly desirable and tactile materials, such as glass, leather, foils, flocking, rhinestones and crystals. This event also uniquely showcases companies in the glass industry from all over the world, along with suppliers of decorative caps and closures, bottle embellishments, cartons and cases, and anti-counterfeiting devices. Of the 7,439 visitors (6% more than 2012) 46% were French and 54% were international. This year, the show organiser IDICE reports a marked increase in visitors from Italy, Spain and the US. - History Telling (and Pioneering) – brands reaffirm their roots, legacy, and history of their expertise to reassure consumers and attract more young people looking for references. Steve McAdam, VP creative services for exhibiting company Leo Luxe packaging, gives his take some of the trends he witnessed at the show: “Trends are currents of change that have an impact on consumer behaviour. Understanding and utilizing trends are paramount in developing successful packaging designs that can effectively compete in an overcrowded marketplace. The overarching theme of this year’s Luxe Pack tradeshow in Monaco was the growing trend and focus on sustainability in packaging. “Leo Luxe embraced this trend by presenting eco-friendly packaging concepts including a collapsible rigid box made from 100% ecological paper and a palette of eco-friendly papers, water-based inks, coatings and UV finishes. All the major carton packaging companies were focussed on innovation but also sustainable solutions, stronger but lighter boards, enhanced printability and interesting textured or tactile finishes. Stora Enzo, for example, presented solutions based on renewable materials including this year’s Pro Carton/ECMA ‘Carton of the Year’ – the ‘Twinkle Box’ created by Van Genechten for Moët & Chandon, which keeps a bottle of champagne chilled for up to two hours (pictured below). Two grades of cartonboard with metallised surfaces were laminated for production, and the outer ply is made from Stora Enso's Ensocoat, the manufacturer’s flagship board for luxury packaging. 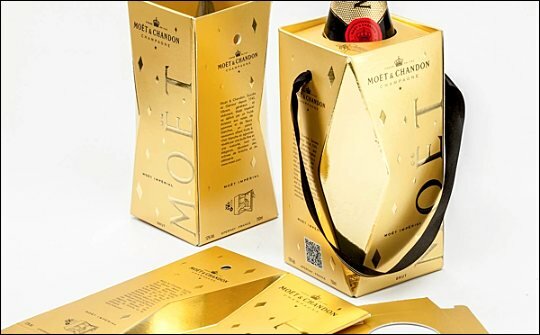 This carton breaks the traditional mould, as it is much shorter than conventional champagne packs and the neck of the bottle is on display while the carton encloses the lower half of the bottle to provide security and shelf appeal. In addition, the carton can be stored in the refrigerator and, being insulated, will help keep the bottle cool once it is taken out. The Scottish based paper and board manufacturer Tullis Russell also showcased packaging developed for leading drinks brands, including the Bombay Sapphire Hi-Light carton, which uses its two side coated board. The company also showed its Trucard bright white, launched at last year’s show, which has been selected by single malt whisky specialists Morrison Bowmore. The distillery has specified Trucard 0 matt and Trucard 0 felt for the outer box liner for its Auchentoshan; Glen Garioch; Bowmore Islay and McClelland’s brands. Ian Hamilton, purchasing and packaging development manager from Morrison Bowmore comments: “Malt whisky is a regular fixture in some of the most competitive luxury retailing across the globe. It’s essential that we deliver premium brands with strong packaging presence that communicates the values of quality and legacy present in every drop of our malt whisky. Trucard 0 uncoated was the ideal choice for the outer packaging. It provided us with two distinctive uncoated surfaces, giving us the opportunity to subtly vary the packaging styles. Both surfaces provide an excellent print performance coupled with a high quality look and feel. BillerudKorsnäs always has a strong presence at the show. The manufacturer’s cartonboard is known to deliver the requirements of upmarket packaging, but extensive remodelling of its board machine has opened up the opportunity to further enhance appearance and printability. Favini, an Italian paper manufacturer, presented its developments for Crush, its ecological range of papers launched at the 2012 show. Crush is the first and only paper to be made using agro-industrial waste and the company says it has been an extraordinary success, outperforming sales forecasts by 425%. This success led to sales in 25 countries, including South Korea, the UK, Russia and China. Indeed, Crush is not just a highly ecological paper, but also a product that ensures optimal levels of print quality at competitive prices, which has drawn the interest of a number of prestigious brands. One such example is I Coloniali bath and body range, which is using Crush for the packaging of its latest product line to enhance value and demonstrate the brand’s commitment to the environment. The new paper is FSC certified, manufactured using entirely self-generated green energy, and contains 30% post-use recycled fibre. Its carbon footprint is 20% less than equivalent Favini papers. Last year at Luxe Pack, Crush was recognized as a game-changing product earning the 'Luxe Pack in Green' award, which is given to the company with the most innovative solution in ecological packaging. This year the winner was James Cropper for its reclaimed fibre plant that recycles paper cup fibre. As an alternative to carton boxes, Eurotextile showcased a vast range of promotional carriers and decorative sleeves and cases for bottles in a vast array of textiles, including cotton, plastic, chainmail, leather, studs and stones. Pictured is a zippered carry pack recently created by Eurotextile for Champagne Taittinger. Pictured below is a line up from EOS of its innovative Skin textured, printed and embellished plastic or textile TPE sleeves, which are clamped on the bottles without the need for glue or heat.